The Freetown Village Singers will help to commemorate the anniversary of Juneteenth at the Eiteljorg Museum of American Indians and Western Art. Join us for a family friendly celebration of African American emancipation with music, performances, demonstrations and fun. FREE general admission. "A Day in the Life of....Rev. Strong"
In our “Day in the Life of...” series, one of the costumed Freetown Village ‘residents’ will share their life experiences with your audience. In the "Day in the Life of Rev. Samuel P. Strong", you'll listen to the moving story of Rev. Strong's kidnapping into slavery and his daring escape to freedom on the Underground Railroad. Share his encounters with legendary abolitionist Harriet Tubman who inspired him. 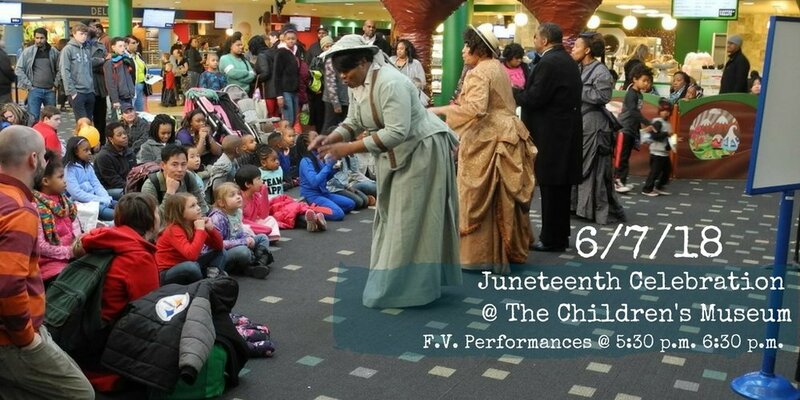 Celebrate Juneteenth with a Freetown Village performance at the Children's Museum on $5 First Thursday. FV Singers will perform at 5:30 p.m. and 6:30 p.m.
She created a rich legacy for women, African-Americans and Indianapolis. This free performance is approximately 30 minutes and will be presented 11:00 a.m. - 3:00 p.m. at the College Avenue Branch Library. The Freetown Village Singers have been invited to perform at the "Little Library on the Prairie" Festival, hosted by the Johnson Co. Library (Trafalgar Branch). She created a rich legacy for women, African-Americans and Indianapolis. This free performance is approximately 30 minutes and will be presented 11:00 a.m. - 3:00 p.m. at the Pike Branch Library. #PreEnact Indy 2019! We'll be there Oct 5th, 10 a.m. - 5:00 p.m., providing interactive, roving theater performances. Freetown Village Celebrates Christmas promises to inspire as it explores the significance of family and cultural traditions during this holiday season. Set in the 1870s in an African American community, the play celebrates the richness of community, the spirit of giving, and the preservation of family traditions. She created a rich legacy for women, African-Americans and Indianapolis. This free performance is approximately 30 minutes and will be presented 11:00 a.m. - 3:00 p.m. at the Wayne Branch Library. The Freetown Village Singers have been invited to the “Celebrating Our Culture” event at Humble Creations Studio. 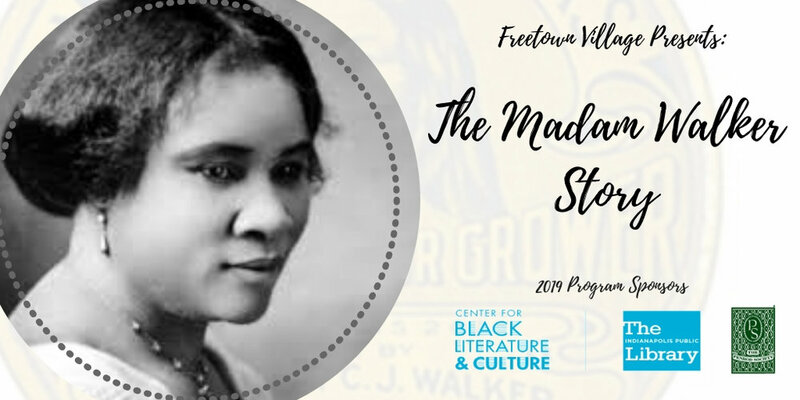 Freetown Village has been invited to present “The Madame Walker Story” as a part of Duke Energy’s (Plainfield, IN) recognition of Black History Month. Join us for this annual celebration of the life and achievements of Dr. Martin Luther King Jr. The Freetown Village Singers will have two 30-minute performances at 1:00 p.m., and 2:00 p.m.
1919 - 2019: What’s Going On? 1919 - 2019: What’s Going On? Join us as we tackle this question at the Indiana Historical Society Monday, January 21st. On your visit to Winterlights at Newfields, you’ll have the chance to hear the Freetown Village Singers. 6:00 p.m. - 6:30 p.m.
7:00 p.m. - 7:30 p.m.
8:00 a.m. - 8:30 p.m.
Join the Freetown Village Singers for a celebration of song and spoken word as we get into the spirit of the holiday season. Enjoy light snacks, door prizes, fun & fellowship with the Indy Parks Seniors Program Family. Performance sponsored by Indy Parks, registration is required. Freetown Village Celebrates Christmas promises to inspire as it explores the significance of family and cultural traditions during this holiday season. Set in the 1870s in an African American community, the play celebrates the richness of community, the spirit of giving, and the preservation of family traditions. Tickets available now. #PreEnact Indy 2018! We'll be there Oct 6th, 10 a.m. - 5:00 p.m., providing interactive, roving theater performances. Stop by the Freetown Village "barbershop" (16th & Yandes), and be sure to check out the vintage race cars (16th Street garage) and learn about the legendary African American race car driver Charlie Wiggins from his "niece". We take pride in shining light on those who are making a difference in our community. Each year, we celebrate local individuals who are impacting change in Indianapolis and beyond! Tickets are $40.00 are now available. The Freetown Village Singers will open for The Campbell Brothers at the Canan Commons, Muncie’s newest outdoor performance venue, located in the heart of Downtown. All concerts are free to the public. In honor of Madam CJ Walker's great achievements and contributions, Freetown Village Inc. brings you this one-woman show of her story through “different” eyes. Freetown Village Singers will perform at 1:00 p.m. at the 32nd Annual IPS/ IEA Multicultural Festival @ Lafayette Square Mall. Table and board exhibits on equity, social justice and diversity will fill the food court, while cultural performances will be featured on stage throughout the day. Freetown Village will be celebrating 35 years of educating through the arts with the Freetown Friends and Family Reunion on Friday April 6th, 2018. This event will take place at the Madame Walker Theatre in the Grand Casino Ballroom at 6pm. If you have ever been a part of Freetown Village, participated or contributed to programs, seen a performance, or just support the mission, you are invited!! Dinner will be catered by Simply Southern Soul Food. Entertainment will be provided by special guest performances from both current and former Freetown Singers and Actors. There will also be an open mic for anyone who wants to grace the Freetown stage with their talents. Sponsored by IndyParks Seniors program division. Light refreshments and guest speaker following performance. Cost is $3.00 person. Contact IndyParks for reservations, 317-327-PARK. Start the celebration of Black History Month off with a Freetown Village performance at the Children's Museum on $5 First Thursday.